Haven't got a lot of time for nails at the mo as I'm meant to be organising a wedding, which is just silly as I'm utterly useless at organising things. Couldn't sort out a piss-up in a brewery TBH. Incidentally, I've not really organised my nail polishes either, I just grab one, go, "oooh, that one looks alright" and put it on. This is how I came to be wearing Opi Ink Suede. Opi Ink Suede. Better than Brett Anderson. Whenever I use these delightful Suede polishes I get Suede songs in my head which isn't as delightful as I don't care for the sound of Brett Anderson's voice. Whiny. And with that said, Ink went on well and looked very nice with some shimmertastic action going on. It eventually got Konaded with GCOCL plate G16 and some MUA Shade 13 (silver) polish, which turned out to be a bit OTT. Some OTT stamping that I couldn't be arsed to sort out. Really, what I should have done is gone over the fingers again with some more Ink, but instead I put rhinestones on the ring finger nails and thoroughly enjoyed picking away at them all night. Stompy,this is so pretty! 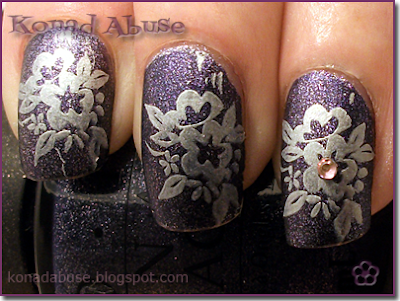 The flower stamps are fabulous! Love that matte purple, it's gorgeous!